I appreciate all our loyal customers, including Betty S. in Tallahassee, Florida, who especially likes Art Deco pieces. 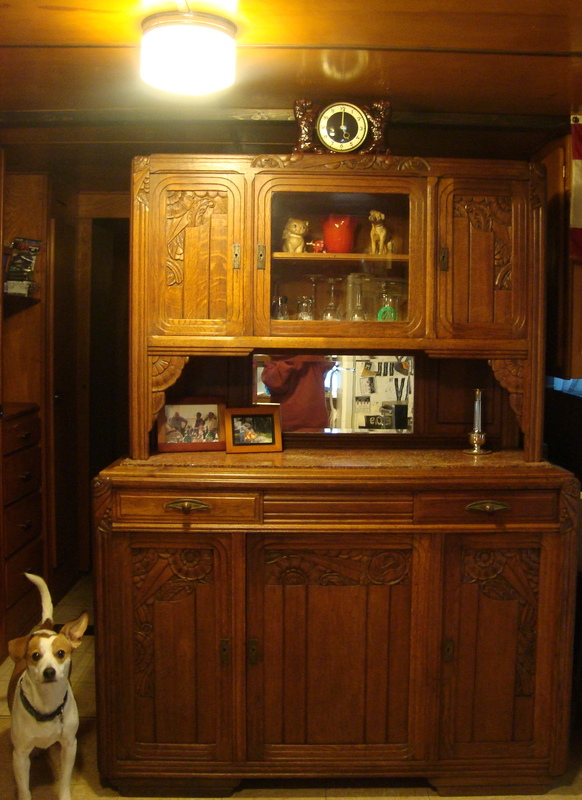 My previous client spotlight on the Art Deco buffet Betty bought from us showed photos of her cool 1958 home. I also explained that Betty is more than just a long-time customer, she is a friend. Betty’s birthday was in December and she decided to treat herself to a birthday present from EuroLuxAntiques.com. 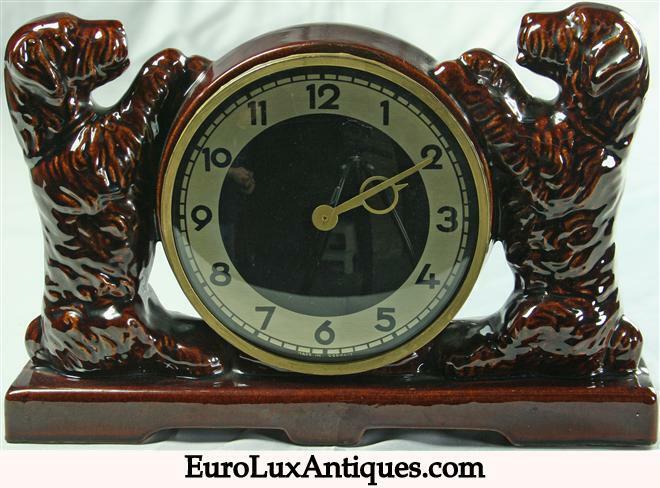 She chose this vintage 1930 German ceramic Art Deco mantel clock flanked by two terrier dogs. The Art Deco clock no longer ran, but Betty decided she would set it for 5:00 (as it’s five o’clock somewhere) and call it art! I appreciate that Betty keeps coming back time and again to buy herself a little something special. We celebrate our 10th year in business in 2014 and we are very flattered that we have met so many wonderful clients who choose to remain in touch with us. 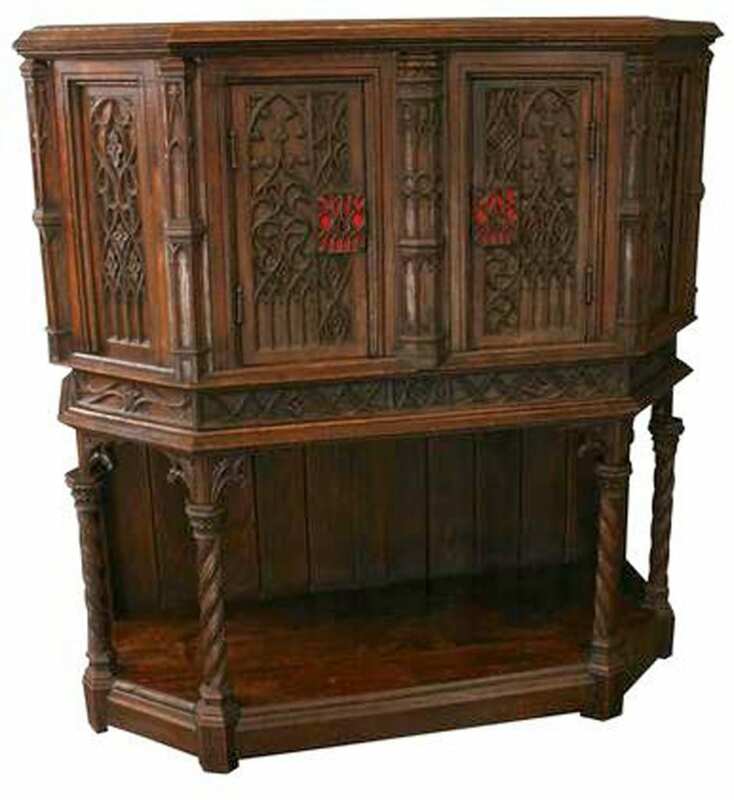 We hear from them periodically and they think of us when they’re looking for their next piece – whether for an antique or for some high-quality new furniture. It means a great deal to hear that we are their “go-to antiques folks” and that they like to share our story with their friends and family. It means we have earned their trust, and that is the cornerstone of our business. We treasure every client and work hard to make sure every sale is a wonderful experience for our customers. It is not always easy, but that is why many businesses don’t provide excellent customer service these days. Often big box stores or online retailers sell in such large volumes that they don’t go the extra mile to make sure every single sale is right and every single customer is happy. Each transaction is just one of many, many sales that day, so it’s hard to treat each customer as an individual. However, because we are a small family business, we strive to make each and every customer feel special and appreciated – as if they were a guest in our home. Betty also bought this very pretty German Art Deco Regulator Clock from us before. Fully working! 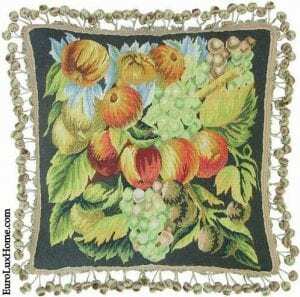 We are happy to spend as much time as a customer needs to help them find just the right piece. I personally oversee all of the shipping arrangements to make sure that everything gets to where it’s supposed to be. And in the rare event of a mishap or delay, I make sure it is taken care of promptly and professionally. We are proud of our track record. 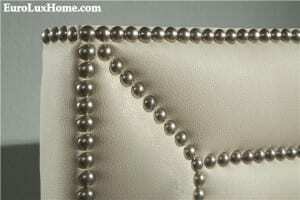 As well as selling directly from our EuroLuxAntiques.com gallery we also sell on Ebay. We have over 3500 unique transactions on Ebay with 100% customer satisfaction in our feedback! Our many wonderful customers like Betty make our job very satisfying. As I said in the Art Deco buffet post, my relationship with Betty goes back more than 20 years. She was a bit of an angel in my life, encouraging my first study abroad experience in Florence, Italy. 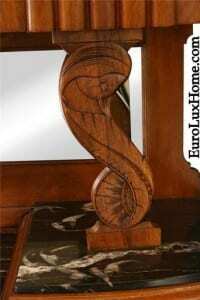 That led to me spending much more time in Europe and then launching this European antiques import business with Greg. So we’re delighted to see the new photos of Betty’s Art Deco clock alongside her other Art Deco collectibles. May those two cute dogs on the clock bring her much joy! 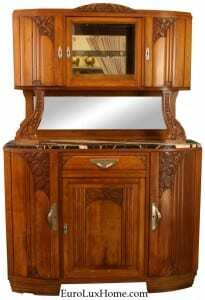 This entry was posted in Antique Clocks, Client Spotlight and tagged Art Deco, Art Deco Antiques, Art Deco Buffet, Art Deco clock, Cats & Dogs on January 14, 2014 by admin. 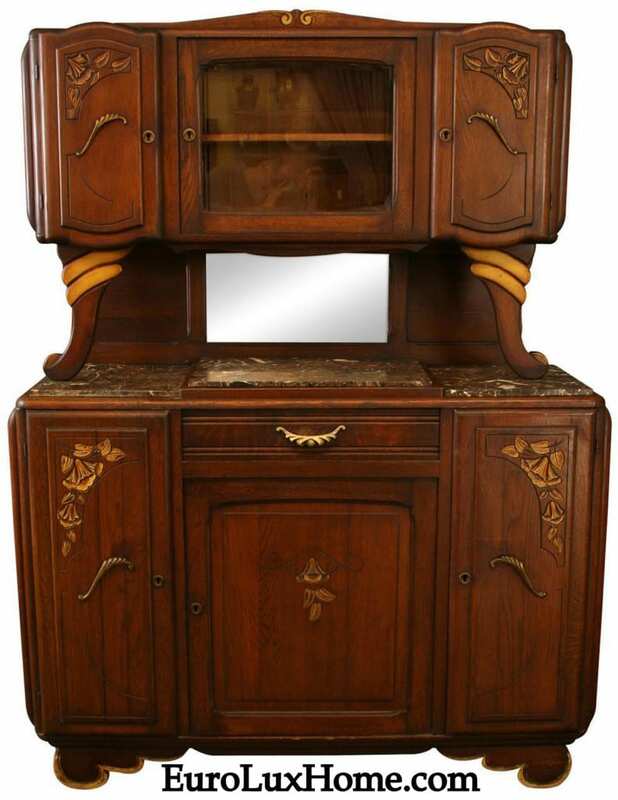 Antique French furniture in the Hunting style is one of our specialties here at EuroLuxAntiques.com. So when a customer buys several antique French Hunting chairs and thrones – plus an Art Deco buffet and a Spanish Renaissance table – it’s lovely to see how they incorporate these treasures into their home. When we made a personal delivery to Robert and Liz in Johnson City, Tennessee, we had the chance to do just that! Robert and Liz live in a wonderful historic home in Johnson City that was on the city’s tour of homes last year. They have quite a few antiques in their home, but it’s a beautiful house from the outside too. I could relax on that shady veranda all day! 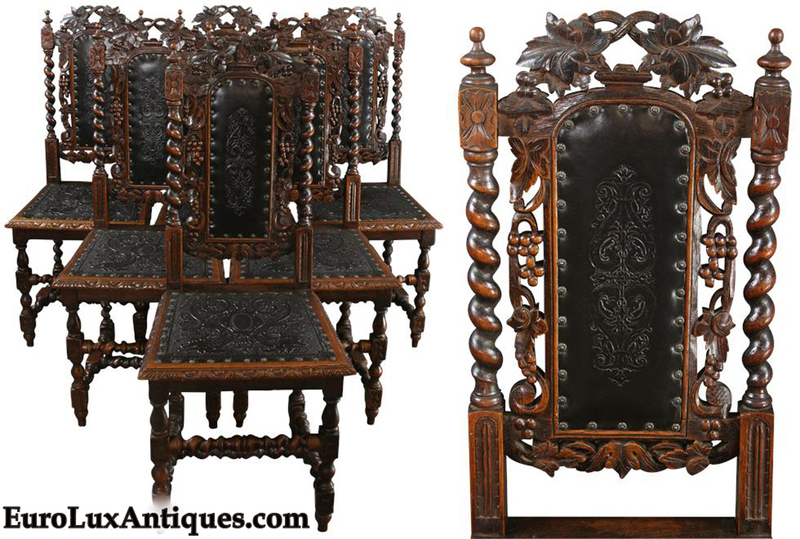 They purchased from us a 1950s Spanish Renaissance table in oak, a set of six oak antique French Hunting chairs (circa. 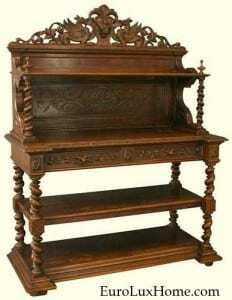 1890) and a pair of French Hunting Thrones, also in oak, dating to 1880. The whole dining room looks magnificent. 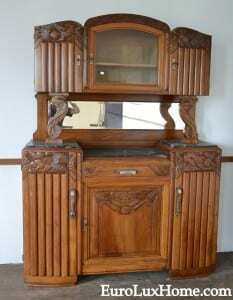 Robert and Liz also bought a pretty 1920s German Art Deco buffet. Here’s another photo of one of the larger French Hunting thrones. The two thrones are placed at the head of the table to seat the host and hostess, or perhaps the thrones are reserved for the guests of honor? 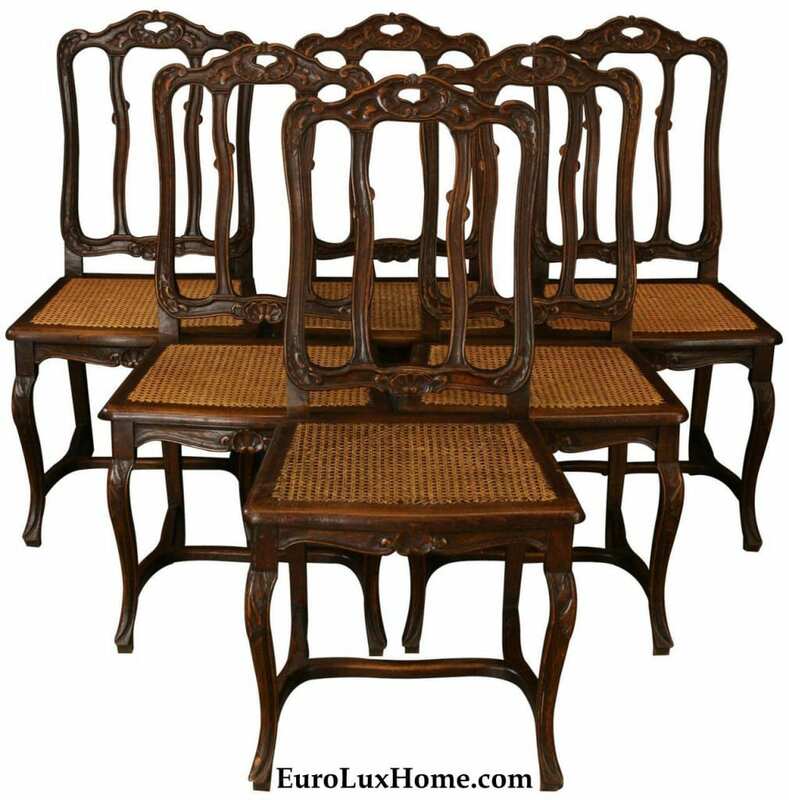 The smaller antique French Hunting chairs line the sides of the table. This shot really shows the amazing carving on the stately thrones, complete with barley twists. 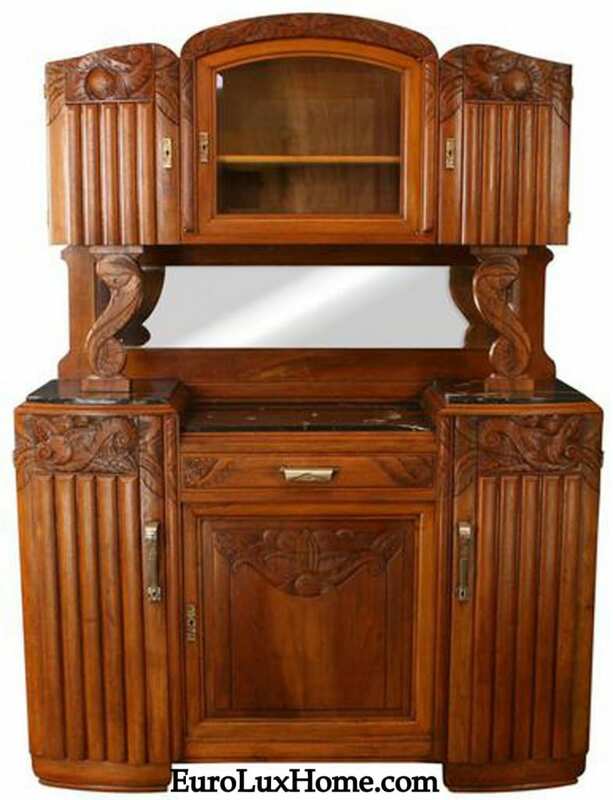 The 1920s German Art Deco buffet is also crafted from oak. 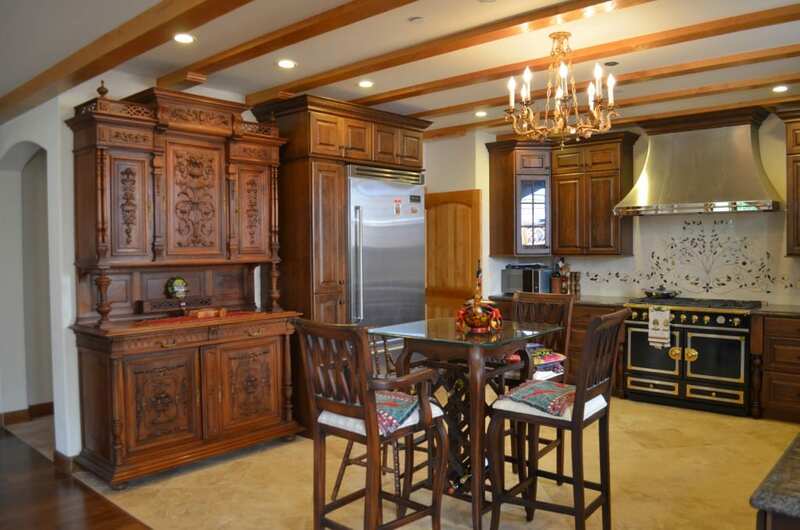 As you can see, there is plenty of space to store all their china, silver, and table linens for when guests come to dine. 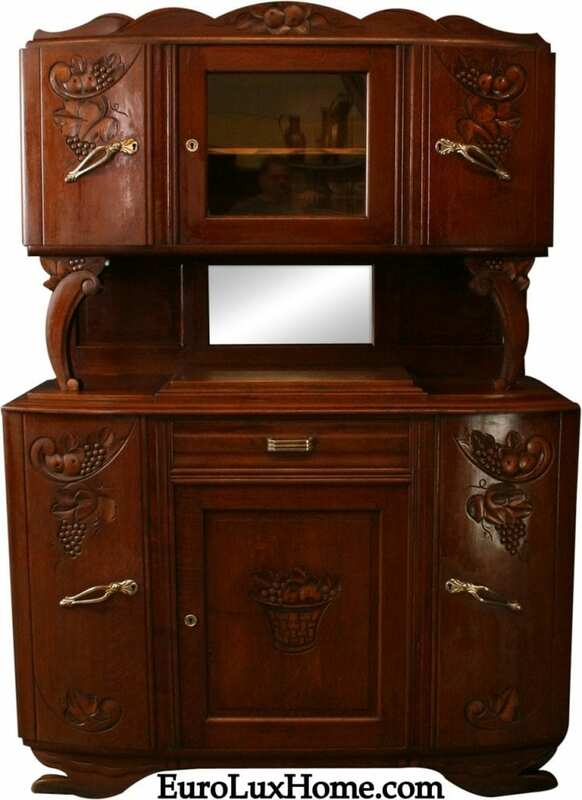 I love how well the Art Deco buffet blends with the older antique French Hunting style furniture. A piano is a finishing touch to the traditional decor in this very comfortable and welcoming home. I can just picture everyone gathering around the piano for some after-dinner entertainment, or even a traditional sing-along. Robert and Liz also have an awesome old early 1950s Chevrolet parked out back that we greatly admired! They were such very nice folks and we enjoyed spending time chatting with them. We mostly use professional companies that specialize in moving antique furniture to deliver EuroLux Antiques purchases to our customers, but sometimes Greg and I take time out of the gallery to hit the road and deliver antiques ourselves. I’m so glad we did this one personally. It was wonderful to meet Robert and Liz and to see their delightful home! 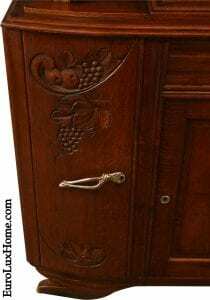 This entry was posted in Antique Furniture, Client Spotlight and tagged antique chairs, antique French Hunting Chair, Antique Furniture, antiques, Art Deco Buffet, dining chairs, EuroLux Antiques, French antique dining chairs, French Antique Furniture, French Antiques, French dining, Hunting Style on April 25, 2013 by admin. 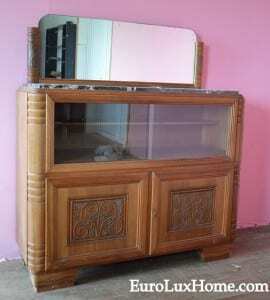 This blog post should actually be titled, “An Ode to Betty S.” Betty purchased a beautiful Antique Art Deco Buffet from EuroLux Antiques as a birthday present to herself at the end of last year. 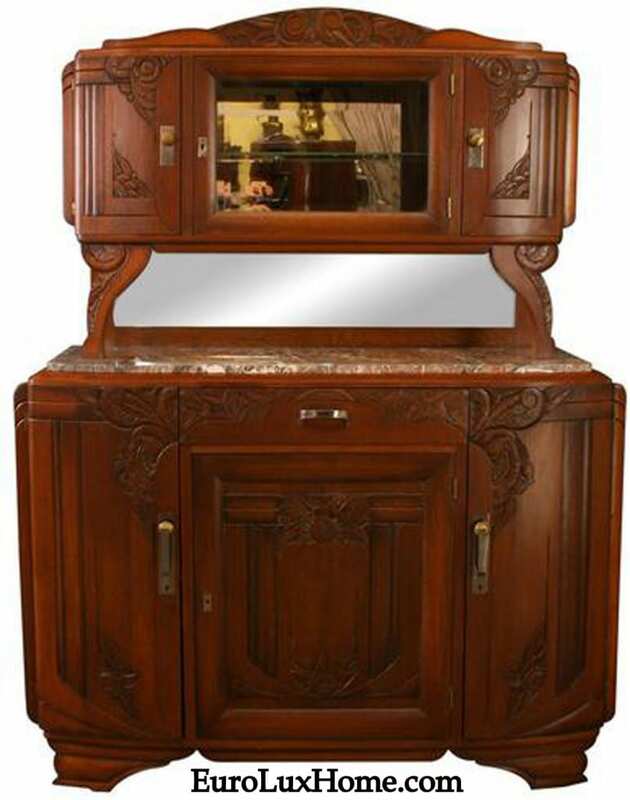 Outstanding Art Deco carvings with a floral motif, original Art Deco brass hardware, and a pretty red striated marble top, make this Art Deco Buffet a knock-out! Betty placed this great piece in her very cool home in Tallahassee, Florida, and it actually acts as a “wall” to separate her kitchen from her laundry room, while providing extra storage space in the kitchen. 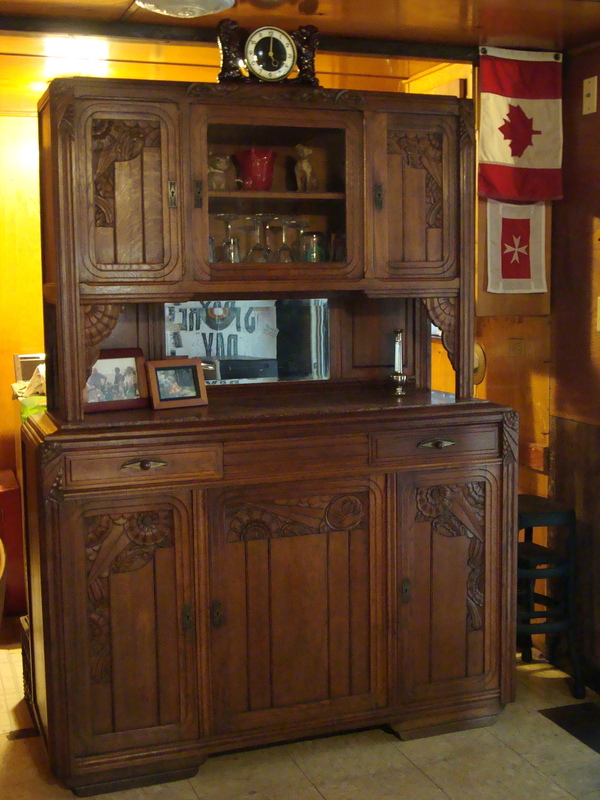 We always enjoy seeing creative uses for antique and vintage furniture! You can’t quite appreciate it from this photo, but you are actually looking at the interior of a 1958 Midway trailer that is at the center of Betty’s funky abode! It was parked in 1966, the original owners added on an addition in 1971, and Betty has added her own additions over time, including a deck and porch, so there is now a mobile home in the middle of the house. From the outside you can see the area on the right is the front of the mobile home and to the left is permanent house. Here is a photo from inside the front door looking through a window on the side of the mobile home into Betty’s kitchen! I am very envious of this great retro patio furniture set with glider! What a wonderful place to chill out with a cold beer or glass of wine. Many of our customers at EuroLux Antiques have historic homes, but this one is truly funky and cool – thanks for sharing your vintage lifestyle with us! Of course, we couldn’t forget to mention that Betty does her part to save homeless pets, a cause near and dear to our own hearts. Aren’t her fuzzy children adorable? 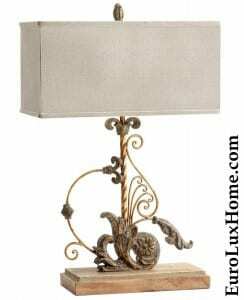 It was a pleasure doing business with EuroLux. Mom and Pop shops are disappearing from the American landscape and I’m happy to have found yours. Your personal, friendly service, the quality of your pieces, and the fact that you truly care about your customers made for a lovely shopping and buying experience. However, I have to explain to you how particularly special this sale was to me. I’ve known Betty for 20 years, having met her back in 1992 in a tiny office (in the maze of the Williams building) on the campus of Florida State University while I was an undergraduate student. I didn’t know then what a tremendous impact Betty would have on my life. You see, Betty handed me a one-page flyer about the Florida State University Study Abroad program in Florence, Italy, and even went the extra mile to help me line up a small scholarship to go on the program. The world opened up to me in such a profound way during that study abroad semester that it truly changed my life’s path. My new-found interest in Italian Renaissance Art led to a Masters degree in Humanities and another trip back to Italy, this time as a counselor for the Florida State University International Programs in Florence. I became hooked on European history and living abroad, and was determined to somehow get back to Europe. Betty became my colleague after I landed a job after graduation with FSU International Programs. I saw first-hand that not only has Betty positively influenced my life, but she has spent her entire career helping thousands of students have incredible study abroad experiences across the globe. I was very sad to leave my friends in Tallahassee a couple years later, but I decided to pursue an MBA in International Business in order to open doors to get back to Europe. 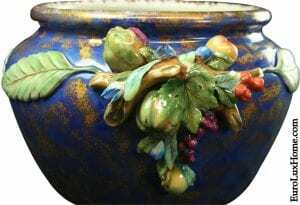 And, to shorten an already long story, eleven years after my first study abroad experience in Florence, my husband and I launched a European Antiques import business – none of which would have happened had I not wandered into Betty’s office twenty years ago. Okay, sniff, sniff, I can’t help that I’m a bit emotional. But I do believe you should always take the opportunity to thank those who have made a difference in your life, and Betty S. – you surely did! Thank You! 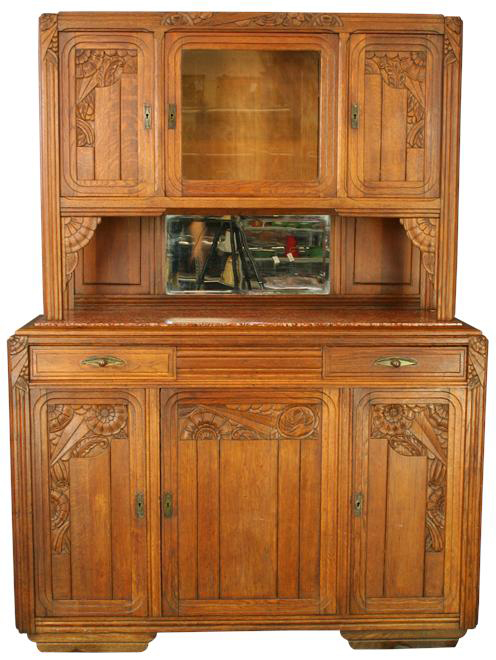 Betty S. bought a very pretty Vintage German Art Deco Regulator Clock – check it out! Dear EuroLux Team, You did it again! You made me a happy camper again. A German Regulator clock cannot compare with an oak buffet but the service certainly did compare. Top notch, five star treatment! Wrapped with extreme care (and I mean extreme), with prompt shipping, no hassle fetch-it from the bus station delivery to my state. I didn’t really expect an eighty year old clock from Europe to keep good time–I will admit it. It was pretty enough that if it didn’t keep time, I would just set the hands to 5pm and pretend it was happy hour somewhere and call it art. You said it worked and I believed that. It didn’t mean it worked well. There you go and surprise me again. It’s keeping great time! Two weeks later. Amazing. The informational sheet you provided on the care of a key wound clock was much appreciated. I learned a few things and apologized to my two other clocks for not knowing better. To top it off, you included a small level. Perfect. Throw in some candy. Why should anyone ever walk into a brick and mortar store again with that kind of service? You know I’ve been in your shop so I know what’s going on, but I didn’t know everything. My visit a few years back affirmed my belief that I had a ‘good student done well’ story. I didn’t necessarily think I’d become a customer. Two purchases later, two appreciative smiles later, and all I can say is please give attaboys and attagirls to your team. You guys are so many steps ahead of the service I’ve come to expect from an internet purchase that I can’t say enough good things. You guys are amazing. Thank you so much. Again. 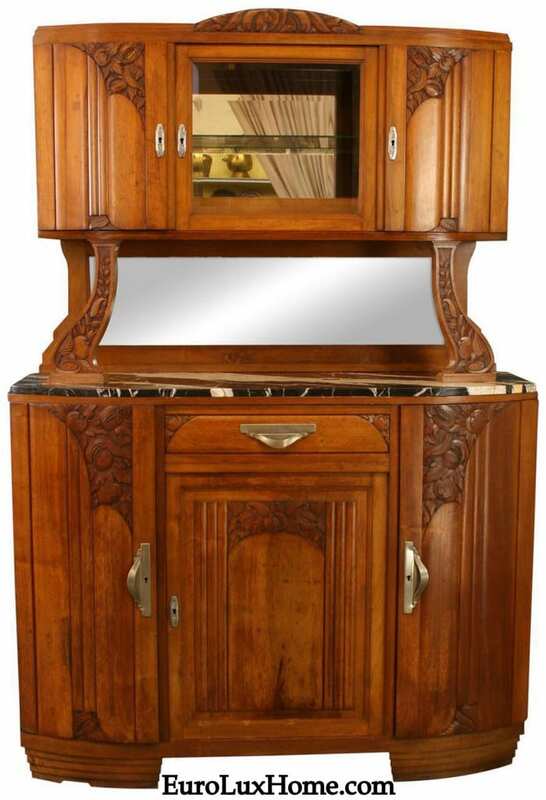 This entry was posted in Client Spotlight and tagged antique buffet, Art Deco Buffet, Florida State University International Programs, Tallahassee on June 7, 2012 by euroluxantiques.